There has been much controversy over this event from which contestants are timed on who is the fastest to run the 50+ meters to the tin crate that holds the Snapper Turtle in roughly 2-3 inches of water. The Turtle is then yanked from the crate of dirty water then sprinted along to the other side of the field from which the contestant started. From there the Turtle is slammed or “placed” as they say on the ground with much force. The contestant then has to push his hand in to the Turtles head cavity then pull the head of the Turtle out before the Snapper Turtle bites. From there the contestant then pulls the Snapper up in the air by their hands and then swings it round their head in what can only be described as some type of hunting cave man macho image. Since 1996 many of the Turtles that have been used in this sick event have died from stress, or injuries that have been sustained from it 1) being dropped on the ground 2) having its head yanked out 3) being slammed to the ground or 4) left to de-hydrate in the blistering sun. There are no rules at all in Indiana that can stop this event, although there are rules for other soft-shelled Turtles that prohibit them from being taken from the wild and used in a cruel act. Please view the video below that shows how badly treated these Turtles are (this is from the 2011 event that caused much out-cry from many animal rights activists) – but then can you blame them and us for showing this ?.. If your thinking of traveling to Indiana or holidaying at the Camp Shore Ground then please watch this event below. And think again – do you want your children to see this?. You can clearly see why we and other animal activists are not just angry but also very upset that no one is taking this event in the American government seriously. Last years event cause much outrage as of many contestants that harmed the Turtle’s. One contestant who was largely built and had blue denim dungarees on was expelled from the event this year in August 2012 so it has been claimed by the event organiser Mr Timothy Sizemore that also owns the Camp Shore grounds. He has been expelled as apparently last year although hard to see he BIT in to the Turtles head after slamming it to the ground then swinging the Turtle around his head like a rag doll. We will be watching to see if he is there this year after managing to obtain a photo image of him from a criminal back ground check that you can clearly look for on any good American people search site. To top this off there was many Turtles dropped on the floor that cause cracks in their shells as the image shows below. The video above starts of with women using the “same” soft back Turtle over a period of what we can roughly estimate of 15 minutes although the video is 12:21 long. The soft back Turtle was dropped, and flung to the floor many times. Yet the organiser of the event claims this is a non animal cruelty event that is fun for all the family including [children]. 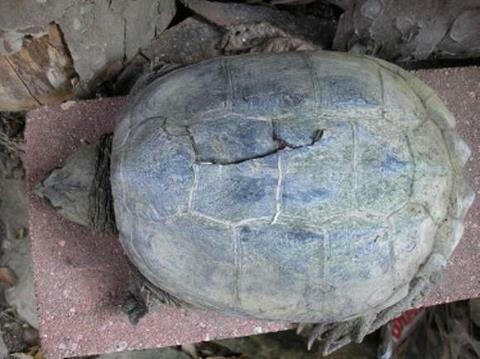 This picture shows an injured Snapper Turtle that would have gone through much stress and discomfort. specialists have said that “This Turtle will most likely now have to be kept in captivity until it is well enough, to avoid any infection from going in to the wound via the broken shell”. “Upon looking this adult Turtle is severely de-hydrated and also suffering”. These are the injuries that are inflicted on such reptiles that are being used as “a profit-making event item” to gain monies for the Camp Shore Ground itself. we call this animal “exploitation”. There is a law in Indiana that states this below. A person having a vertebrate animal in the person’s custody who recklessly, knowingly, or intentionally abandons or neglects the animal commits cruelty to an animal, a Class B misdemeanor. A person who knowingly or intentionally purchases or possesses an animal for the purpose of using the animal in an animal fighting contest commits a Class A misdemeanor. However, a person who knowingly or intentionally promotes or stages an animal fighting contest, uses an animal in a fighting contest, or attends an animal fighting contest having an animal in the person’s possession commits a Class D felony. Further, a person who knowingly or intentionally beats a vertebrate animal commits cruelty to an animal, a Class A misdemeanor. However, the offense is a Class D felony if the person has a previous, unrelated conviction under this section or the person knowingly or intentionally tortures or mutilates a vertebrate animal. However after reading up on this law and speaking to 3 different independent legal animal and non animal lawyers this law sadly does not in no way protect that of the Snapper Turtle. What it does protect is that of some smaller species of the soft shell Turtle of the Trionychidae family. In 2011 there was much anger to at the banner that was placed on the front of the Camp Shore Ground that had Budweiser and a Snapper Turtle on the logo sheet. Since contacting Budweiser we like many others have been given the same automated response that has been sent to members of the public and animal rights activists. Please view below. On all occasions that Budweiser has been contacted they have sent this response out. We received one today “exactly the same”. We have E-mailed Budweiser back and have asked them to make a formal statement that they knew nothing on the logo that was printed in 2011 by a “specialist printer shop” and also to pull all their brand goods from Camp Shore Park that hosts the Snapper Turtle event. We saw only last month that Heineken when they found that their logos where being used in a dog fighting event in Indonesia they did not just pull the logos out they pulled the whole Heineken range out including all beers, posters, coasters, and beer mats. Then went on a spree around another 4 Indonesian bars and done the same. Heineken then issued a press statement on-line confirming they had nothing to do with the event. Budweiser has known since August 2011 that this event has been going on and have only issued the same response to anyone that has complained to them that is pictured above. They also claim they save animals from abuse, and NEVER become embroiled in events like this. OR any animal cruelty events. Please see below proof of their sponsorship of cruel rodeos. 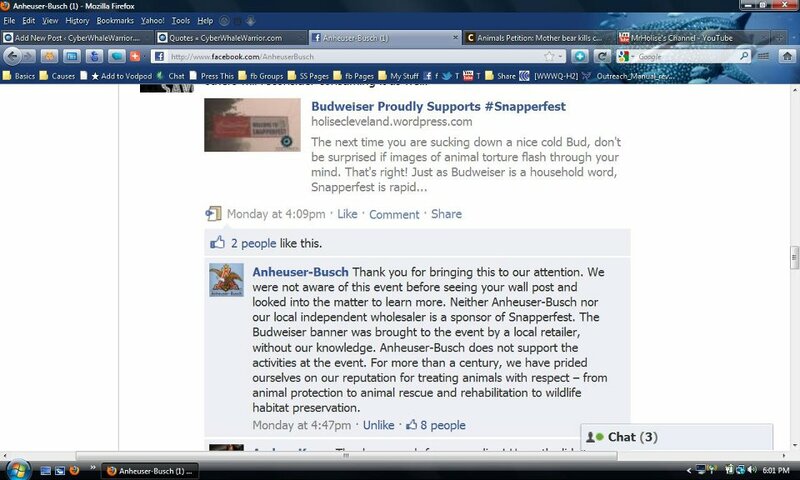 BUDWEISER NEVER SUPPORTS ANIMAL CRUELTY EVENTS ?? WE BLOW THERE COVER AS WE INVESTIGATE THUGS LIKE THESE WHEN WE SEE SUCH EVENTS. PLEASE VIEW THE ARTICLE BELOW FROM SHARK INVESTIGATES. WHAT DOES THEIR AUTOMATED E-MAIL SAY AGAIN ?? The Camp Shore Park owner Mr Timothy Sizemore pictured below has classed the event as nothing but family fun that all are welcome to join [EXCEPT] PETA and animal rights activists along with “only his own choice of media. That being Mr Richard Jaff that also [claims Turtles are nor harmed in no way] please view that picture below. Mr Sizemore claims that its all a bit of family fun. Mr Richard Jaff is a TV journalist, his Facebook page is https://www.facebook.com/pages/Rich-Jaffe-Local-12-News/127316180690445 an email has been sent to him asking why he believes this is a non cruel event and also to explain to us why he is holding a reptile in this way that he claims is not causing it any harm. Since checking out Mr Turtle Abuser above Mr Sizemore owner of the Camp Shore Grounds in Indiana we have also found that PETA have been doing a GREAT job on showing to the world that this man and the event that he hosts on his site is now losing money. We recently checked Mr Sizemore’s Face page listed here https://www.facebook.com/timothy.sizemore.1/photos#!/timothy.sizemore.1 and saw that he is now asking his buddies to create fake G-mail accounts to write-up reviews on the Camp Shore Ground. 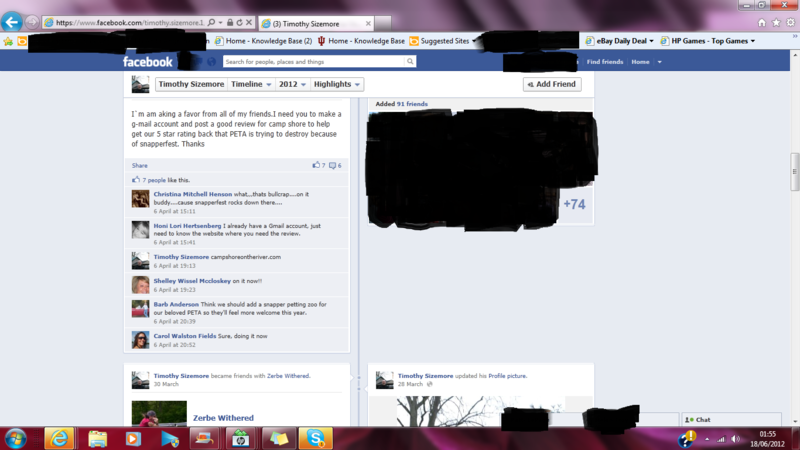 Please view the screen shot here below. Other non-related issues have been blacked out to protect the investigative journalist and those that are not related to the Snapper Fest event. Snapper Turtles can take your finger or two off if you decide to handle them and not show them respect. So how should one handle a Turtle? Please view below from an EXPERT that has many years of experience with these Turtles. He is also not in no way a participant in this cruel event nor is he cruel to any animal. 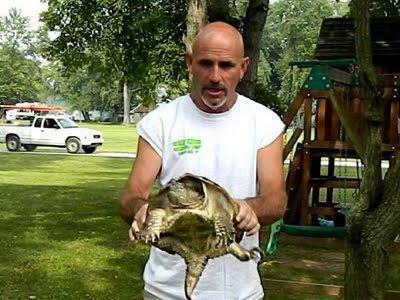 HOW TO HANDLE A SNAPPER TURTLE (SOMETHING THE JUDGES AND THE GOVERNOR OF INDIANA NEEDS TO ADDRESS).. 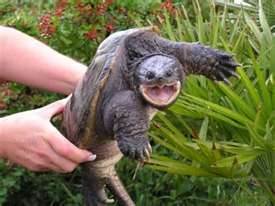 When we viewed mr Sizemores Facebook account we saw that he had pictures on their that where of Snapper Turtles being handled in the inappropriate manner please view below. If this is not animal abuse and yet the experts have claimed it is then what is this world coming to. You can now clearly see why where angry. No only is Mr Sizemore and Mr Rich Jaff “TV REPORTER” handling these animals in a cruel way and allowing these animals to be abused in this way on his land (Mr Sizemore’s) they are both going against what experts quote “is not the way a Snapper Turtle of this size or any size” should be handled. 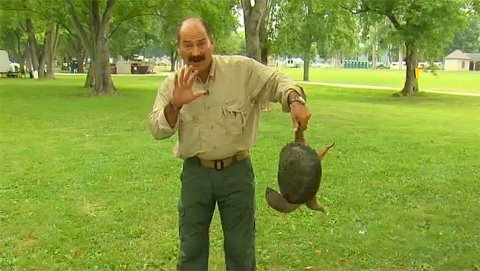 (History from Wikipedia) – The common snapping turtle (Chelydra serpentina) is a large freshwater turtle of the family Chelydridae. Its natural range extends from southeastern Canada, southwest to the edge of the Rocky Mountains, as far east as Nova Scotia and Florida and as far southwest as northeastern Mexico. This species and the larger alligator snapping turtle are the only two species in this family found in North America (though the common snapping turtle, as its name implies, is much more widespread). Common snapper’s are noted for their belligerent disposition when out of the water, their powerful beak-like jaws, and their highly mobile head and neck (hence the specific name “serpentina“, meaning “snake-like”). In some areas they are hunted very heavily for their meat, a popular ingredient in turtle soup. These turtles have lived for up to 47 years in captivity, while the lifespan of wild individuals is estimated to be around 30 years. 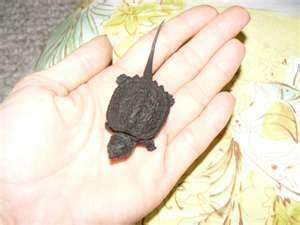 Below shows a baby Snapper Turtle..
Why would anyone want to harm such a beautiful Turtle for? Turtles are treated like crap in most nations. Common Sea Turtle is severely endangered in Costa Rica waters and also in most part of Asia as from which they are taken from the wild and sold live in large hyper-markets for food. The average live span of any Turtle species runs from 80 to 150 years. The picture dictates the correct way in which one should hold a Snapper Turtle. 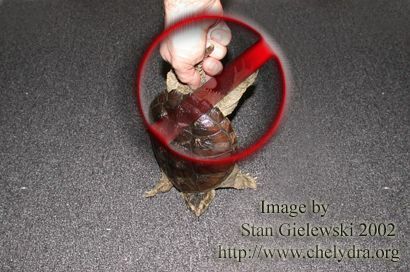 Or you can grasp the Turtle in the palm of both hands just under its rear keeping it forward and away from your face. Snapper’s do jump, not high but enough to snap in to your face if you do not hold it correctly and that you really do not want. Treated with respect and these vertebra reptilian will love you. Their home though is in the wild and not in captivity. They grow very large and are not a suitable pet to keep especially around children as they do pack a nasty bite that can take your fingers of. How not to handle is pictured below. Again these are moron hunters that are holding the vertebra reptilian by its tail from which its bones can become dislocated very easily as of their weight and the gravity pulling down on the turtle. This picture we have enlarged so all those that visit the Indiana Snapper Turtle Fest can educate each other on NOT to handle a Turtle like this. This picture is also in the link above to from which you can view other related pictures and information on the Snapper Turtle with credits to Mr Stan Gielewski. PETA (People for the Ethical Treatment of animals has made a stance on this event too. They last year documented on the event calling it a disgrace to the animal kingdom, barbaric and nothing but cruel. Some of the posts are below PETA and the HSUS that documented on this. The event draws huge crowds of families, including children. The organizers defend the event, saying it is all in good fun and that the turtles are unharmed. Bryan Field, the police chief in nearby Aurora, Ind., has received many complaints about Snapper fest, but insists he is unable to do anything about it. The event occurs outside of the Aurora Police Department’s jurisdiction. PETA urges the public to speak up and put pressure on the organizers to put an end to the festival. A number of contacts in the region are listed on the organization’s website. If your thinking of going to the Snapper Fest with a Camera or video recorder then after the 2011 event you may be turned away well just a good site that you may think of looking up. http://www.spy-craft.co.uk/spy_cameras_hidden_cctv/Interchangeable_covert_button_camera_set.htm all of these are very cheap to purchase on the market or you can look up on YouTube and find out how to make your own. There extremely good for covert recording and have a multiple set of button heads that blend in to your clothing. We feel that it is very necessary to record what happens at the event as of the cruelty that goes on there. Contacts that you can E-mail and phone including the Indiana police department SHOULD you notice any animal being is below. Other contacts that you can Email and also phone are below. You can also contact the Governor of Indiana Mitch E. Daniels on the address below and leave a comment/email in the box for him then press send. Please remember to be polite when sending all E-mails. Mitchell E. Daniels, Jr. is the 49th Governor of the State of Indiana. We have also now taken advantage of AVVAZ they launch campaigns which very high numbers. So to contact AVVAZ please use the contact link below, then draft them a polite E-mail asking them to launch a campaign for the ending of the Snapper Turtle event on Camp Shore Grounds Indiana, Rising Sun. TOGETHER WE WILL STOP ANIMAL ABUSE DEAD IN ITS TRACKS.